[S816] L. Vernon Briggs, Cabot Family, page 326. [S816] L. Vernon Briggs, Cabot Family, page 465. Courtney was enumerated in Antioch, Contra Costa Co., CA, in the 1900 federal census in the household of his cousin Curtis Montgomery. Also in the household was aunt Ella. Courtney registered for the WWI draft on 12 September 1918 in Emoryville, Alameda Co., CA. He was a banker and his nearest relative was wife Emma. Courtney and Emma were enumerated in the 1920 Emeryville, Alameda Co., CA federal census. He was a banker age 42, she was 38. Children in the household were Emma J. 8, and Janice 5. [S807] Find A Grave, online http://www.findagrave.com, memorial ID 39151029. [S807] Find A Grave, online http://www.findagrave.com, Find A Grave, database and images (https://www.findagrave.com : accessed 06 May 2018), memorial page for Laura Lucile Bromley Dixon (22 Jul 1913–27 Jan 1989), Find A Grave Memorial no. 125837020, citing Pleasant Grove Cemetery, Red Hill, Lawrence County, Tennessee, USA ; Maintained by Robert Wix (contributor 48111824) . [S816] L. Vernon Briggs, Cabot Family, page 685. [S816] L. Vernon Briggs, Cabot Family, page 686. Gary Boyd Robert lists William as the probable parent of Sarah. Maria Buckminster Moors was born on 26 April 1866 at Boston, Suffolk Co., MA. She married Godfrey Lowell Cabot, son of Dr. Samuel Cabot and Hannah Lowell Jackson, in 1890. Maria Buckminster Moors died on 5 November 1934 at Boston, Suffolk Co., MA, at age 68. Virginia Wellington was born on 23 September 1899 at Medford, Middlesex Co., MA. She married Thomas Dudley Cabot, son of Godfrey Lowell Cabot and Maria Buckminster Moors, on 15 May 1920. Virginia Wellington died on 15 September 1997 at age 97. [S807] Find A Grave, online http://www.findagrave.com, memorial ID 159847391. Child of Katherina Kober and Johannes Trump Jr. (?) Stroud married Catherine Thompson, daughter of William Thompson and Elsie Hampton. George and Addie were enumerated in tnhe 1875 Silver Creek, Chautauqua Co., NY, state census. He was a mechanic age 31, she was 27, the only child in the household was Burton P. 11 months. George and Addie were enumerated in the 1880 Silver Creek, Chautauqua Co., NY, federal census. He was 36, she was 31. Children in the household were Burtie 5, and an as yet unnamed son 3 months (Vernie). George and Kittie were enumerated iin the 1892 Westfield, Chautauqua Co., NY, state census. He was 46, she was 31. Children in the household were Burt 18, Vernon 12, Howard 7, Ethel 6, and Wilson 4. George and Kitty were enumerated in the 1900 Westfield, Chautauqua Co., NY, federal census. He was a farmer age 56, she was 39; they had been married 16 years and she had three children all still alive. Children in the household were Burt P. 25, Howard 15, Ethel 13, and Wilson 12. George and Kitty were enumerated in the 1910 Westfield, Chautauqua Co., NY, federal census. He was a dairy farmer age 66, she was 49. They had been married 27 years, he twice she once. Children in the household were Bert 36, Vernie 31, Howard 25, and Wilson 22. Vernon and Howard would be on the farm with their own familes in the 1920 census. 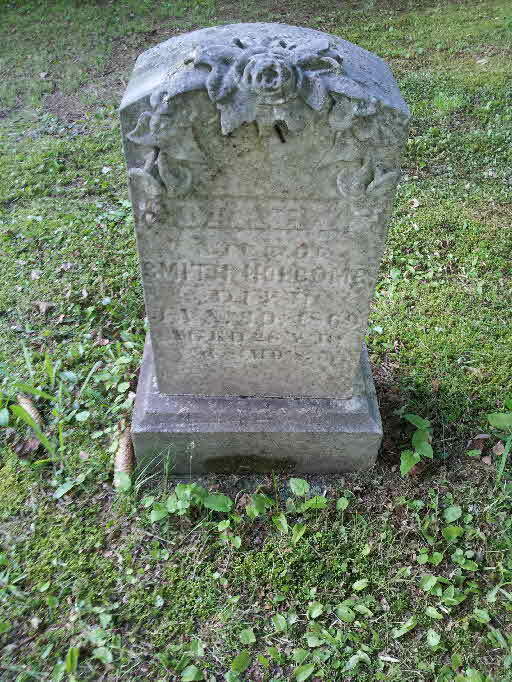 [S807] Find A Grave, online http://www.findagrave.com, memorial ID #8831829. William Holcombe was born circa 1854. He was the son of Abel Porter Holcombe and Druscilla Beals. Sarah Mulford was born circa 1844 at NY.1 She married Victnew Holcombe, son of Cyprian Holcombe and Almira Howe. Eugene M. Holcombe was born circa 1859 at Marcellus, Onondaga Co., NY. He was the son of Albert Warren Holcombe and Orinda Susannah Porter. Eugene M. Holcombe married Della Buchanan on 12 January 1888. Eugene M. Holcombe died on 31 March 1934 at NE. Elmina L. Way was born in August 1862. She married Charles E. Holcombe, son of Imri Holcombe and Sophronia Frank. 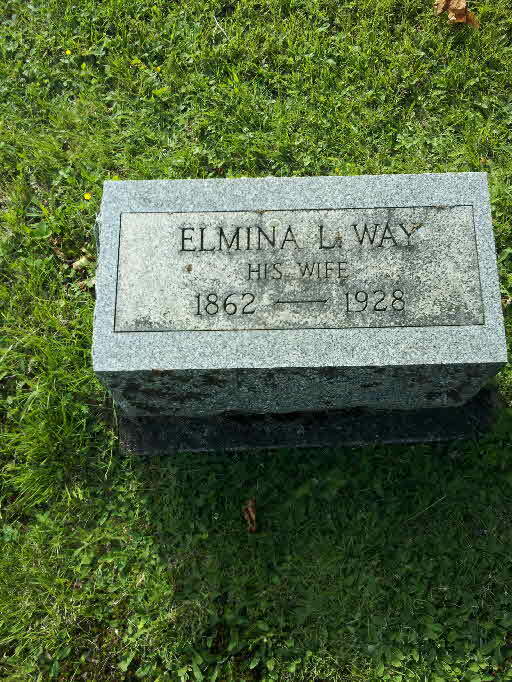 Elmina L. Way died in 1928. Abel Porter Holcombe Jr. was born circa 1860. He was the son of Abel Porter Holcombe and Druscilla Beals. Abel Porter Holcombe Jr. died on 5 September 1917. Katherine A. Riley was born on 11 April 1851 at NY. She married Stephen Smith Holcombe, son of Homer Holcombe and Betsey Maria Darrin, on 28 June 1871. Katherine A. Riley died on 8 February 1923 at age 71. Mary (?) was born circa 1841. She married Stephen Smith Holcombe, son of Homer Holcombe and Betsey Maria Darrin. Mary (?) died on 30 January 1869. She was buried at New Ohio Cemetery, North Colesville, Broome Co., NY. [S807] Find A Grave, online http://www.findagrave.com, Find A Grave, database and images (https://www.findagrave.com : accessed 25 February 2019), memorial page for Marshall Lorraine Holcomb (1898–Feb 1984), Find A Grave Memorial no. 35582622, citing Mountain View Cemetery, Rapid City, Pennington County, South Dakota, USA ; Maintained by Frankie (contributor 47186687) . 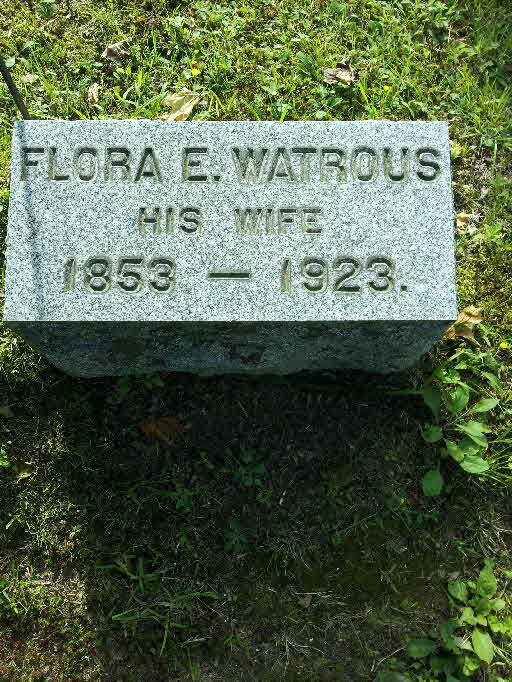 Flora E. Watrous was born in May 1853 at NY.1 She married Seba A. Holcombe, son of Imri Holcombe and Elizabeth J. Miller, circa 1871.1 Flora E. Watrous died in 1923. She was buried at New Ohio Cemetery, North Colesville, Broome Co., NY.